This entry was posted in Days at Home, Family, Gypsy, Racing, Traveling Days and tagged deer in flowerbed, genealogy, Jeff Gordon, smiths fort plantation, tabby cat, workboats in fog. Bookmark the permalink. Love the foggy photo……………..our liriope have been munched to the ground too – anything “tender” seems to be on the deers’ “must eat” list! Good luck helping your possible distant relation in his genealogy mission too. This made me remember several years ago the hubby bought a pair of #24 earrings at the Richmond race. He teased me about liking Gordon because he didn’t (Earnhardt fan, Sr. and Jr.) It’s been years since we’ve gone to any Nascar races…good reason to have television, ha! The fog in the first shot is really great, although I imagine that living too long in it can become dull. 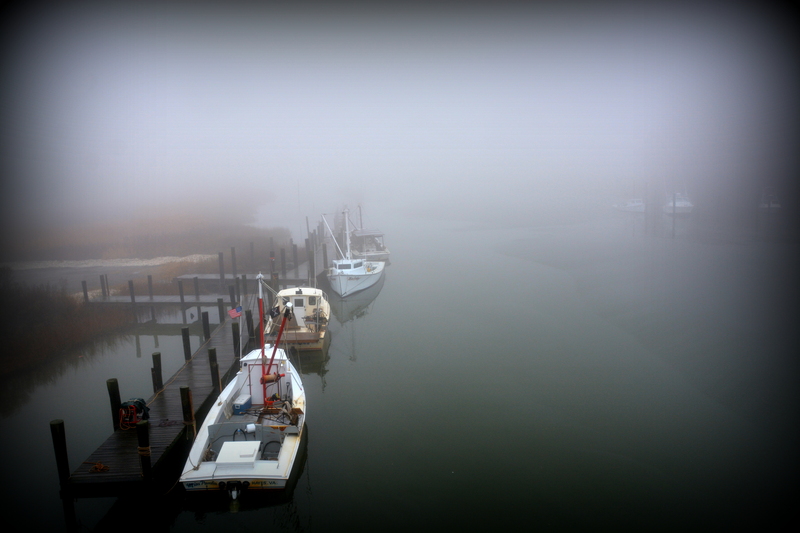 Your fog photo is both beautiful and eerie, Dianna. You have such interesting Friday 5’s. 1) Your fog photo has a real quiet peaceful feeling about it. 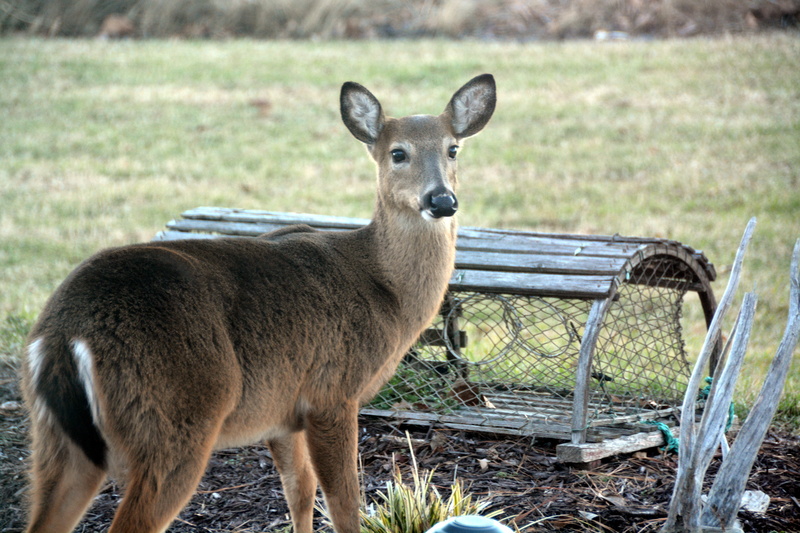 2) Oh my, that Deer is gorgeous, it has good taste in it’s snack choice. Great photo. 3) Gypsy girl is a peach. It looks like she’s enjoying the conversation with her favorite fellow. 4) Jeff Gordon, retire, wow, I never thought he would. It’s nice you & MM pulled for him. I’m not familiar with most of the drivers, but Jeff was one that became a household word early on. I wish him much enjoyment in his retirement. 5) Awesome on the contact with a distant possible relative. That’s such fun. I hope you all can get the line joined. I look forward to your updates. I always look forward to your R5F. Always interesting. And you’ve really had contact with a lot of people through your blog. I look forward to hearing more about our possible distant relative! Another instant favorite photo for me – the fog! What a precious picture of MM and Gypsy. Wouldn’t it be neat to have connected with a ‘new’ distant relative? GREAT Randomness! Fog makes for some ethereal photos.. pretty click Dianna! Cool about the gentleman in Georgia! You and Rick could share fog and deer photos, but the deer don’t visit that close to a window. I haven’t had possible distant relatives contact me but what I do find interesting is members of my father-in-law’s engineering group in the army and Rick’s ship in the navy contact us for info. 1. Great foggy photo! Even with the snow, we had a foggy night this week but it didn’t last long. 2.While they may be beautiful, the damage they do to our plants and shrubs isn’t. 3. MM & Gypsy having a heart-to-heart makes one adorable picture. 4. Didn’t know that about Jeff Gordon, but then I don’t follow racing either. 5. How neat that you found some research to help him out! Oooh, love hearing about the possible distant relative. Yes, please keep us posted. I love the fog foto and of course the beautiful lariope grazer. Your randoms are always so interesting. That was some serious fog the other morning … probably the thickest I remember ever driving in.. 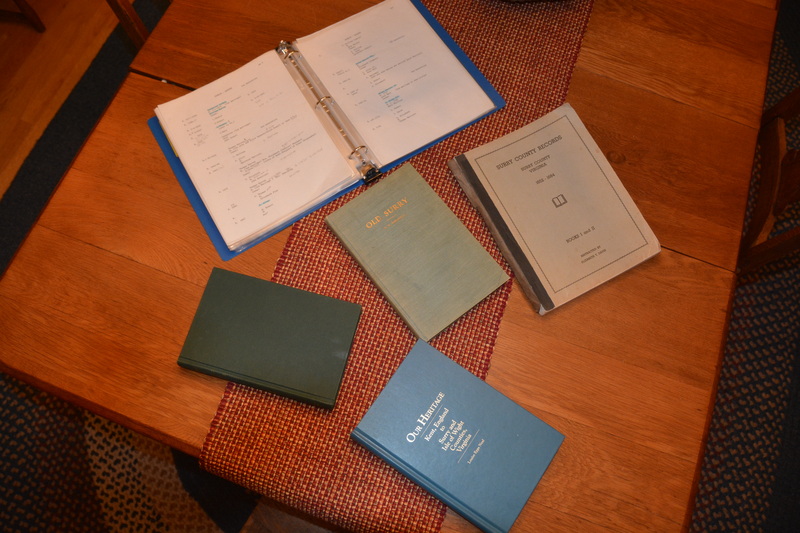 I just know Gyp and MM got to the bottom of whatever business was at hand, and I love the photo of your research area …. ! let me know what unfolds ! 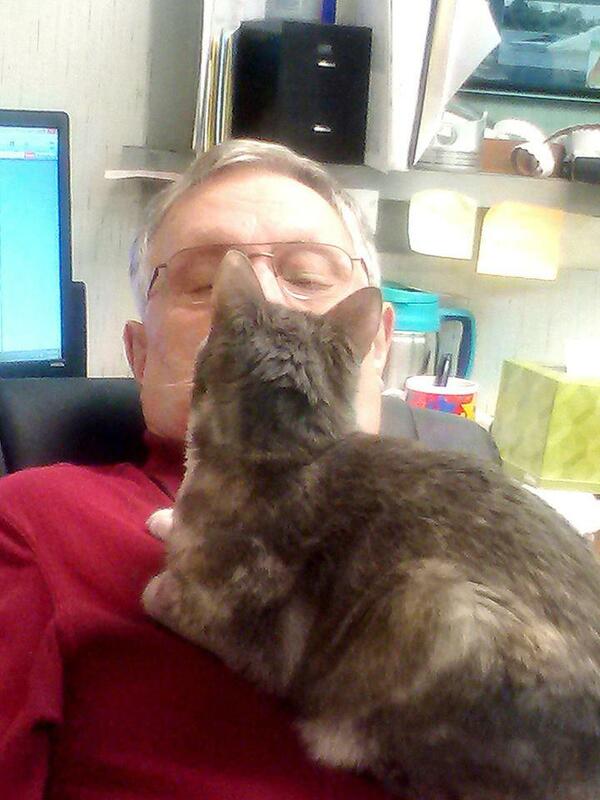 Gypsy does love her daddy! Good luck on your research, sounds like fun. Hope you and JR have a good weekend. The fog lends an ethereal sense to your photo. At least your deer holds still for a photo! Who was doing the most talking, MM or Gypsy? 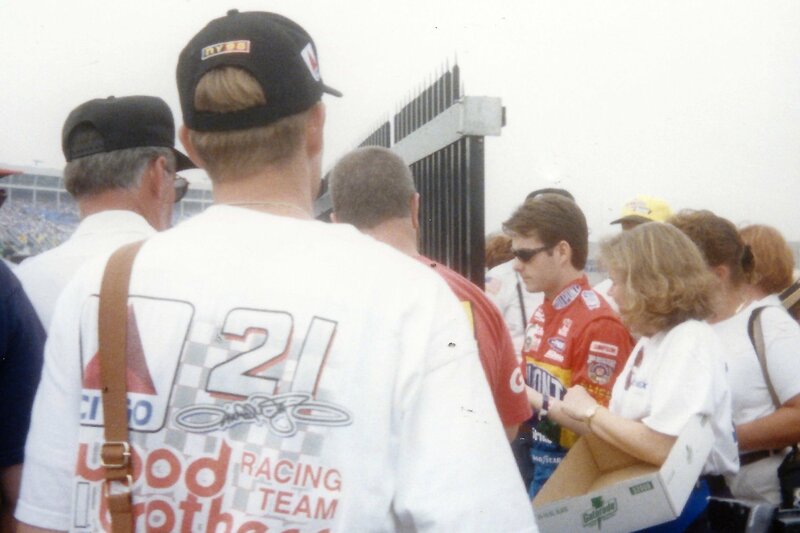 I’ve been a Jeff Gordon fan since he came on the scene–back when Earnhardt gave him a hard time about having to toast with milk at the awards ceremony.